The Symphony Sales Processing Module is accessible from the business office, home office or anywhere you have access to the Internet. You’re never more than a few clicks away from creating a sales quote and emailing it to your prospect, who will be able to view it and approve it online. All in all, this application allows you to prepare attractive, professional quotes for your prospective customers. The system serves as a very effective tool to log all your sales activities, from initiation of customers’ interest to order production. Once the order is generated, the rest is handled by the downstream systems converting an order into active service(s). Once the opportunity is in the system, a quote can be generated. The system supports security roles, which are based on the sales hierarchy, meaning that an agent can access his/her customer opportunities, and a supervisor can access all opportunities for all agents assigned to him/her, and so on up the chain. 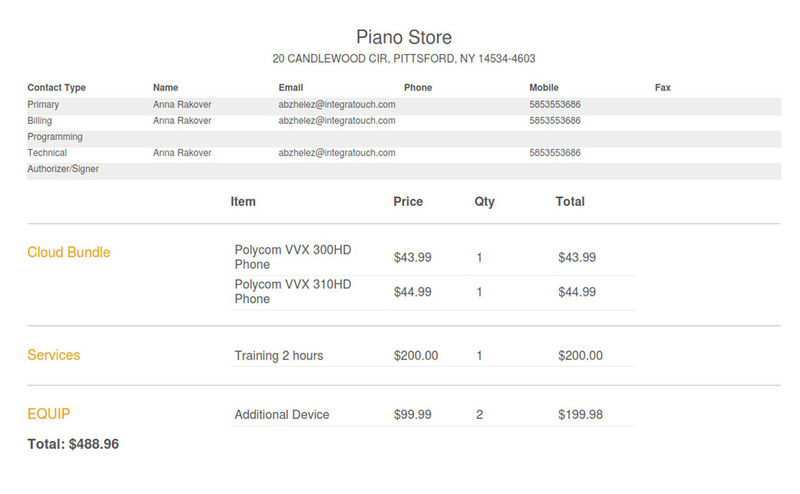 The Symphony Quoting portion of the Sales Module allows the users to specify products for a customer to generate a quote. The quote can be saved as a PDF for further communication with the prospect. The quote document supports additional user documentation as part of the quote, including a welcome letter, user guide for the given product and the quote itself. What makes Symphony Sales & Quoting different?